Here at Home Leisure Direct we have years of experience in buying and selling pool tables, and can advise you on exactly what you want and need from a brand new pool table. We have created a range of videos that will inform every aspect of your decision, from basic differences such as English or American Pool to choosing your pocket type, slate style and cloth. Our videos will take you simply and easily through what can be a daunting array of options, allowing you to choose the right pool table for your needs. 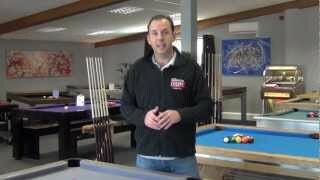 For your first stop we recommend watching our Pool Table Buyer's Guide, presented by our managing director, Andy. 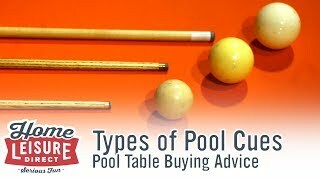 This video will give you a fantastic overview of the many types of pool table available, the relevant options on each table, and much more. 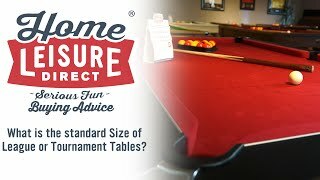 Whether you're looking for a standard English pool table, an American pool dining table, or something else, this video will help to narrow down your choices and get you on the road to choosing a brand new table. One of the most crucial decisions you will have to make is the style of table you want; English or American Pool are the most common choices and almost certain to meet your needs. In our video entitled "What Are the Differences Between English and American Pool? ", Andy takes you through a tour of the differences between the playing styles, the differences in table construction, and the nuances of the separate games. We're sure that this video will help you to choose the right game for you. Some of our most popular pool tables are pool dining tables; that is, they double as a dining table between games of pool. They are a great solution if you’re pushed for space, or to double the functionality of a single piece of furniture. Our pool dining table designers and manufacturers understand that not all homes have the space for both a pool table and a dining table, so we offer a huge range of pool dining tables that merge the two. 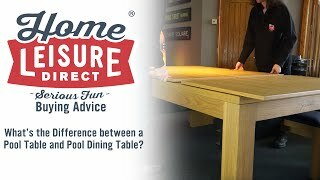 We recommend our video entitled "What Are the Differences Between a Pool Table and a Pool Dining Table?" to really appreciate how these types of table differ. If you're trying to conserve space, a pool dining table may be for you, but certain styles of table (especially those with deeper cabinets) are only available as standard pool tables. After you've absorbed all of the information in those videos, you can start to narrow down your choices by watching some of the other videos we have in this section. If you want to know whether you need a ball return system or drop pockets; we have a video to help you. If you want to know what size table would be best for your space; we have a video for that, too. We can help you with different pool table cloths, sectional slates, cue stab and ball burn, and even pool table installation. This page is an unparalleled resource for buying a pool table and will help anyone to reach a final decision. If you've watched our videos but still haven't come to a decision, feel free to contact our sales team by phone, email or in person. Our award-winning team have a wealth of experience and really know their stuff when it comes to both pool and billiard tables. With years of experience in pool, we can hold your hand as much or as little as you like. If you are unsure about cloth colours or wood finishes, we can send you samples out free of charge to help you make that decision stress free. If you are concerned about your space, size of the table or whether or not a table will fit in your space, then you can either download any of our “Will It Fit?” guides or call the team who will happily help you over the phone. Of course, the very best option is to visit our Showroom to see our incredible range, try them out for yourself and talk to our expert staff in person. If you need any help with purchasing a pool table, choosing the right kind of table, or one of our other services, please call us on 01454 413636 or 0800 622 6464, or you can email us sales@homeleisuredirect.com, or why not visit our amazing showrooms - here's How to Find Us. Pool Table Buyer's Guide We take you through everything you need to know to choose the right pool table or pool dining table. Can I play snooker on a pool table? We explain how you can play snooker on your pool table using the correct size balls. What are the Differences Between Various Types of Pool Cue? An explanation of the different styles of pool and snooker cue. 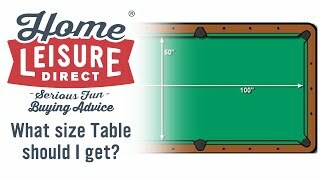 What Size Pool Table is Right for Me? A guide to what you need to consider when deciding on a size of pool table. 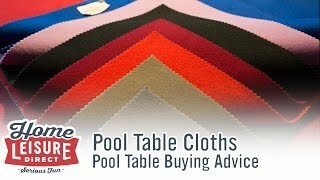 What are the Differences Between Pool Table Cloths? A comparison of all the different styles of pool table cloth, and what gives each their unique characteristics. What are the Differences Between English and American Pool? 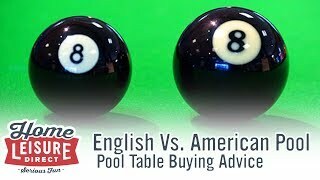 All the differences between English style pool and American style pool, from the table to the balls themselves. What Size Pool Tables are used In Leagues? A guide to the standard sizes of table used in pool leagues. What is the Difference Between A Pool Table and a Pool Dining Table? We explain the difference between a regular cabinet pool table, and the new and increasingly popular pool dining table. How do I Measure My Space for a Pool Table? 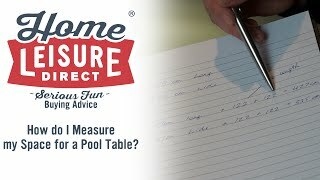 We explain the steps to measuring your room for a pool table. What Accessories Should I get With My Pool Table? 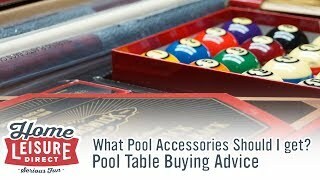 With so many pool table accessories to choose from, just which ones should you consider when getting a new table? What are the Differences Between Types of Pool and Snooker Balls? 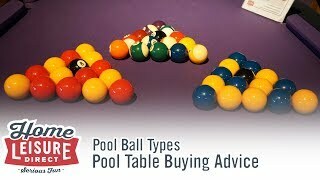 An in depth guide that explains the differences between all the available pool and snooker balls you can get for your table. What is the Difference Between Drop Pockets and a Ball Return? 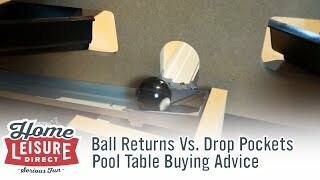 We explain how tables differ when equipped with either drop pockets or a ball return. 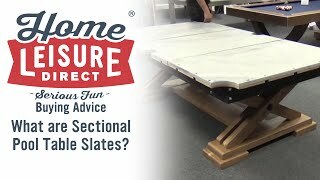 What are Sectional Pool Table Slates? We explain the differences between a single piece, and a sectional slate pool table. 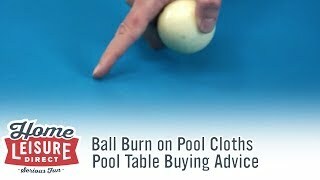 What is Ball Burn on an American Pool Cloth? This guide explains the light coloured marks commonly found on American pool table cloths. 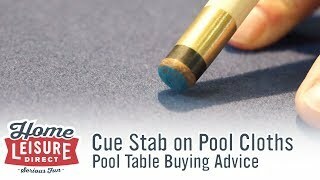 What is Cue Stab on an English Pool Cloth? This guide explains a cloth mark that commonly occurs on English pool table cloths. How are 8 Ball and 9 Ball Pool Different? 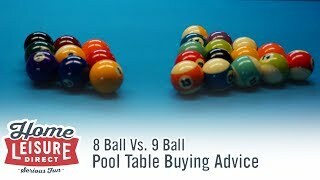 A guide explaining the very different rules found in 8 ball and 9 ball pool. Can a Pool Table be Installed Up or Down Stairs? 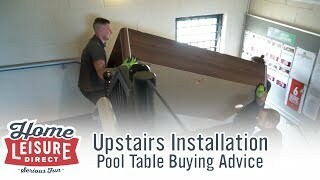 This guide explains the logistics of installing pool table on a floor that requires scaling a flight of stairs. 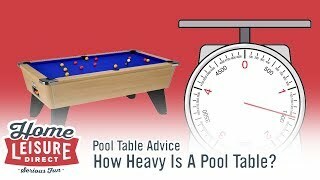 How Heavy Is A Pool Table? Find out how heavy a number of different types of pool table weigh to aid in your planning.